art school owners specifically for other martial art school owners. Stop entering the same info in 10 different systems. RainMaker makes it easy for you and your staff. Manage, market, sell and automate the small stuff so you can focus on the big stuff. Make your life easier. 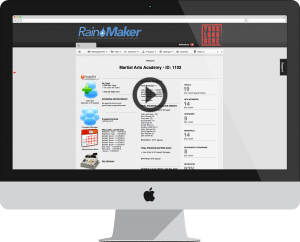 RainMaker Is Your Best Employee and It Pays For Itself. It Never Takes a Break...It Works 24x7, So You Can Have a Life and Still Know Everything is Getting Done. 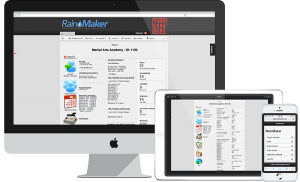 Martial Arts Billing Software by RainMaker Membership Systems was created to give you more control, more focus, and more freedom. Do you hate having to use 11 different types of software just to run your business? Email, Point of Sale, Appointment Booking, Billing, Text Messaging, Digital Signature, and more...and none of them seem to talk to each other which means you have to enter each contact into every single different tool. What's worse is sometimes contacts get entered into most BUT not all parts of your system. That's when people start to fall through cracks. Some members don't get billed which means you don't get paid. Some don't receive your emails which means they can't sign up for your next promotion which means you lose money. Others don't get the text message letting them know you haven't seen them in a while...which means they never come back, which of course means they cancel their membership and of course that means your revenue not only doesn't grow...it goes down. You can use RainMaker Martial Arts Software App to stop all of this now. Don't let people fall through the cracks and feel unimportant, indifferent and remorseful about being a part of your program. Imagine...you wake up in the morning and check on your business. You see 5 new prospects, 2 trial memberships have been purchased, 4 new trials have been sent text confirmations and both people that purchased their trial scheduled their own first appointment AND joined your private Facebook group. As you start to look deeper you see the financial reporting was delivered to you and all of your membership payments have already been processed. Then you see that 4 people's payments were declined and follow-up messages were already sent to them to allow them to update their payment information without having to call you. You also notice several online purchases from last night for equipment and future special events. And you see your goal tracker tells you that you're 70 percent towards your goals for the month and it's only the 14th! On top of all that you see that your last email marketing campaign launched and the numbers are already growing. With RainMaker, life is good! 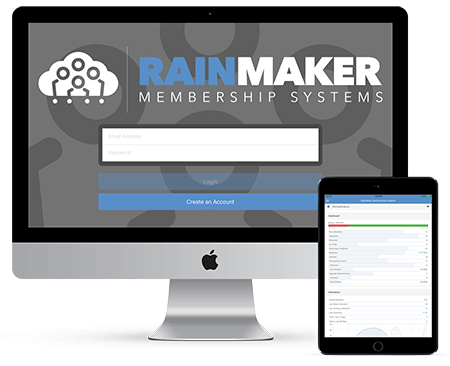 RainMaker's online martial arts member management and marketing software is built with membership business DNA baked right into it. What that means is that it's designed to work the way you do. We understand the day in and day out stresses and obligations of your business. Everything from marketing, training, selling, working with staff, and even financial management. We know what it's like to have members quit. We know what it's like to have limited time, tight resources, and juggling all that while trying to balance a life outside of your business. RainMaker continues to evolve and grow based on the solutions you need to issues and challenges that happen on a daily basis. The online software works automatically in the background so you can spend your time with your members, building rapport, creating engagement, and expanding your tribe.